Copper Fit® compression products are manufactured with copper ions bound at the fiber level during the manufacturing process. 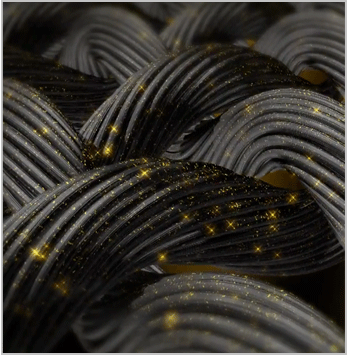 Our copper fiber process will not easily wash out or quickly wear away, and has been tested to remain effective for numerous washes. More important, copper is environmentally friendly, a natural mineral, and is a required nutrient of many ecosystems present in nature. 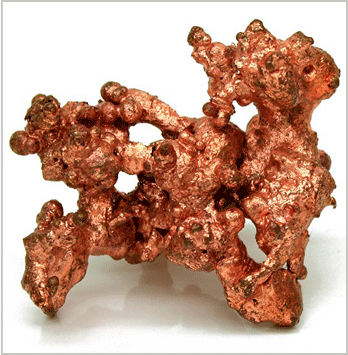 For thousands of years people have appreciated copper's many natural properties. Ancient Egyptians, Romans, and Aztecs used copper for many purposes, and it is known to possess properties that protect against odors and other benefits. Compression garments are only effective when they are being worn and properly sized. 7 Jakeman, J.R., C. Byrne, R.G. Eston. 2010. “Lower limb compression garment improves recovery from exercise- induced muscle damage in young, active females.” European Journal of Applied Physiology, 109(6):1137-44. NOTE: Compression garments are only effective when they are being worn and properly sized. 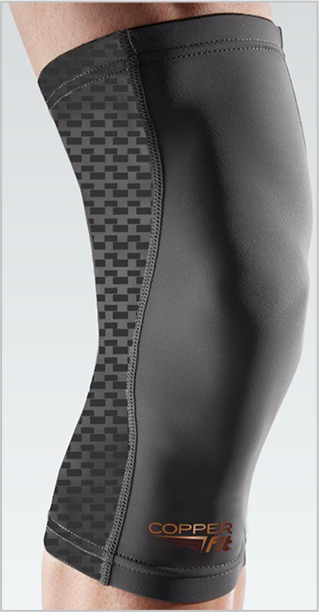 Compression garments have long been known for providing muscle and circulatory support. 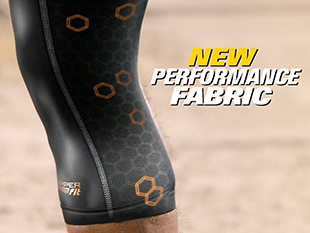 Copper Fit's new performance fabric and contour construction provides a perfect fit and all day comfort compression. Discreet smooth fit even under clothing. KNEE SLEEVE SIZING: To get the correct fit for you, please measure the circumference of your thigh, approximately 5” above the center of your knee. You may need to adjust the brace a few inches up or down to the get desired compression and comfort. ELBOW SLEEVE SIZING: To get the correct fit for you, please measure the circumference of the middle of your biceps and choose the size that fits that measurement. Is Copper Fit® right for me? 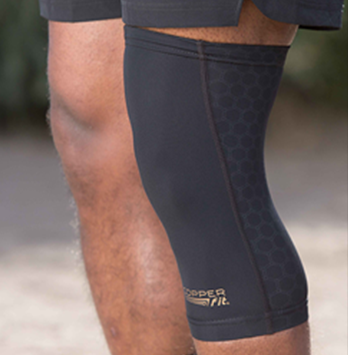 Copper Fit® copper-infused compression sleeves are designed for the average person to the accomplished athlete. Anyone seeking support for muscle soreness, aches and pains, or support for improved circulation and recovery time of muscles can use Copper Fit®. They are comfortable and lightweight. How quickly will I feel the benefits of wearing Copper Fit® compression sleeves? Everyone is different and just like all injuries, soreness, and aches and pains vary in degree. How much time it takes to feel a benefit in wearing a Copper Fit® compression sleeve can range from almost immediately to a gradual improvement over an extended period of time. Remember, compression sleeves are only beneficial when they are worn and when properly sized. 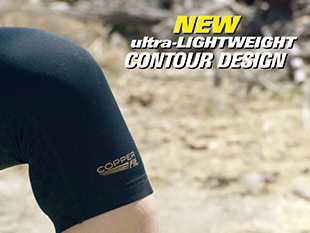 Copper Fit® compression sleeves offer the highest quality copper-infusion and comfort fit to allow for extended wear. When should I wear a Copper Fit® compression sleeve? 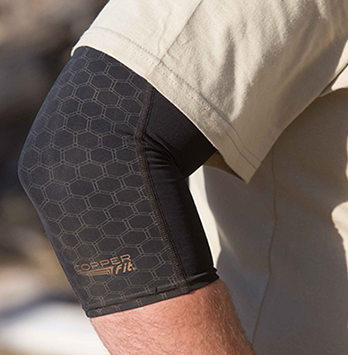 Copper Fit® compression sleeves can be worn anytime. 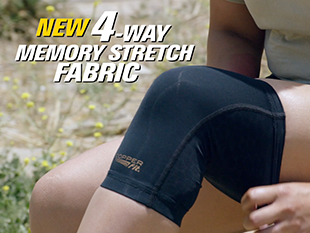 The Knee Sleeve may be helpful when you are working out, running, walking, or standing for extended periods. The Elbow sleeve may be helpful when you are using your arms for lifting or repetitive movements. Wearing a compression sleeve when you're most active may help stabilize and support muscles and promote circulation. But Copper Fit® can be worn when inactive, too, as compression sleeves help keep your muscles warm and may help provide support for pain and soreness. Remember, compression products are only beneficial when they are being worn – and you can wear Copper Fit® anytime, anywhere. This product contains silicone on the inside of the upper elastic band, which may cause skin irritation. If you experience any irritation or discomfort, discontinue use. I'm a Patriots Fan but I love Copper Fit!!!!!!! When I heal up and get back into training shape I'm gonna be all about trying this product!!! It helps out my left knee tremendously. I have a torn meniscus in the inner part of my left knee. I couldn't walk as far as I do without it. Don't run without my knee sleeve!! How many Buy One Get One Knee Sleeves would you like? How many Buy One Get One Elbow Sleeves would you like? Through this special offer, you'll receive your Copper Fit® Sleeve for just $19.99 plus a one time $3.99 shipping and handling fee! Plus as a special BONUS, we'll also include a second Copper Fit® Sleeve in the same size! 30-DAY MONEY BACK GUARANTEE (minus S&H). A $10 surcharge is added for orders sent to Canada, Guam, Puerto Rico, Hawaii, US Virgin Islands and Alaska. Sales tax will be applied to orders from CA, CT, NJ, NV & WA. For customer service please call 866-533-1182 or email ideavillage@custoemrstatus.com To check the status of your order, please click here.